A muzzleloader hunter may take one legal buck anywhere in the state. 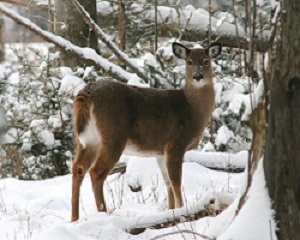 In addition, a hunter who received a muzzleloader antlerless deer permit may take one antlerless deer in the Wildlife Management Unit (WMU) designated on the permit. An archery hunter may take a legal buck anywhere in the state, provided they didn’t take one in the earlier part of archery season. An archery hunter may take an antlerless deer anywhere in the state. A legal buck is a deer with at least one antler having two or more points one inch or longer. An antlerless deer is a deer without antlers or with no antler longer than three inches. A deer with three-inch or longer spike antlers may not be taken during the archery, November rifle, or muzzleloader seasons. A muzzleloader or archery license is required in addition to a standard hunting license, except for a nonresident who chooses to purchase just a limited archery license for the archery season. Vermont hunters may take up to three deer in a calendar year with appropriate licenses and permits for each deer season (archery, youth weekend, November rifle, December muzzleloader). Only two of the three deer in the annual limit may be legal bucks, but only one legal buck may be taken in each season. Check the 2018 Vermont Hunting & Trapping Guide for more regulation details. It’s available where licenses are sold and on Fish & Wildlife’s website (www.vtfishandwildlife.com).